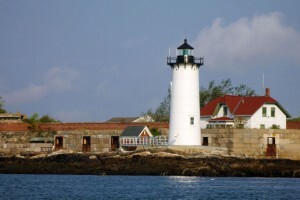 ALF’s Friends of Portsmouth Harbor Lighthouses chapter hosts an annual five lighthouse cruise each year. This fun cruise will take place on September 22 starting at 8:30 a.m. aboard the M/V Granite State, departing from Rye Harbor on Route 1A in Rye, NH and will return at approximately 1:00 p.m. . The cruise will pass close by White Island Light, Boon Island Light, Cape Neddick “Nubble” Light, Whaleback Light, and Portsmouth Harbor Light. We’ll also enjoy great views of the Isles of Shoals, southern coastal Maine, Portsmouth, and the Piscataqua River. The cruise will be narrated by lighthouse historian/author Jeremy D’Entremont and there will be a raffle with lots of great prizes. There is a snack bar on board the vessel.